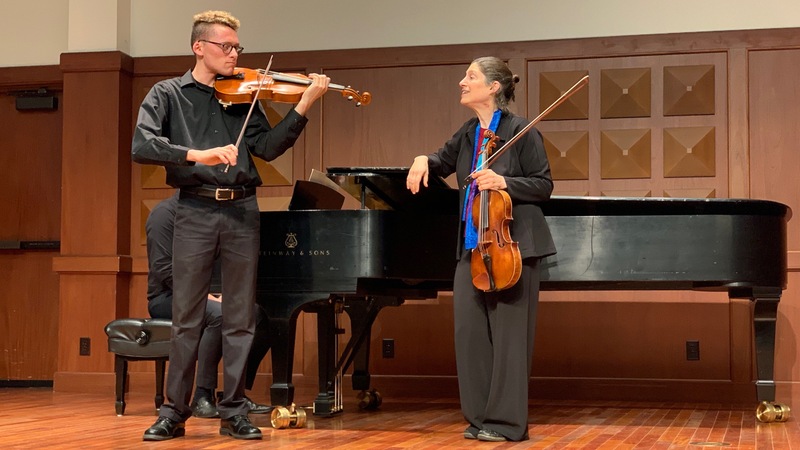 February 4, 2019, 8:44 PM · When you take a masterclass with violist Kim Kashkashian, you never quite know what might happen. You might wind up doing a little walk-dance to Bach, or using a beanie-baby lamb to aid your bow arm, or even kicking off your shoes and strumming your viola like a guitar. The well-known and well-loved Kashkashian gave a master class in January at the University of Southern California's Thornton School of Music to a well-filled recital hall (they kept having to put out more chairs as more people arrived!). Kashkashian has taught viola and chamber music at the New England Conservatory since 2000. In 2012 she received a Grammy for her recording of Music For Viola by Kurtag and Ligeti, and prior to that recorded an album of Hindemith sonatas - solo, and with pianist Robert Levin. More recently, she released a recording of Bach Six Suites for Solo Cello on viola last fall. She also volunteers for Music for Food, a musician-led initiative to fight hunger. Once a student of the late violist Karen Tuttle, Kashkashian clearly has strong ideas about playing with ease and demonstrating techniques that allow for injury-free coordination on this infamously unwieldy instrument. The masterclass began with a performance by violist Yun-Chieh (Jenny) Sung of the "Prelude" from Bach's Cello Suite No. 5 in C minor. She was playing with a beautiful sound and satisfying intonation, but she began to have a few memory slips. Kashkashian, sitting at the back of the room for the initial performance, told her to go ahead and use the music. "Lesson number one: if you are still more comfortable and free with the music, then use it," Kashkashian said. "There will come a point when you are more comfortable without the music, and that is when you should walk out without the music on the stand." Sung had taken the movement at a rather majestic tempo; Kashkashian wanted her to move it along slightly, reflecting the movement's cut-time signature. "I feel like you are having four impulses per bar, rather than two," Kashkashian said. As an exercise, Kashkashian had Sung play the beginning of the Prelude while walking across the room, taking a step for each beat in the bar. The slightly faster tempo will lend itself to longer phrases, Kashkashian said, and traveling through harmonies rather than lingering on as many of them. Kashkashian also talked about articulation: "You must lift the bow, to get air in the dotted rhythms," she said. String players are trained to place the bow on the string before moving it; "I don't think that's always effective," Kashkashian said. Instead, she suggested moving into the string like an airplane that is landing, rather than like a helicopter landing. To work on this feeling, she had Sung practice bow circles, in which the goal was to circle through the air and then through a down-bow, keeping the motion continuous. Then she tried the same motion, with a series of up-bow circles. To simplify this exercise, one can try the same thing, holding the bow farther up on the stick. "It's a very different feeling, and it gives more depth and more freedom to the line," Kashkashian said of using this bowing strategy. This Bach Prelude moves into a section in 3/8 time that requires some attention to voicing. In order to get the back-and-forth feeling of two voices here, Kashkashian suggested practicing one voice arco (bowed) and one voice pizzicato (plucked). "We want the idea of the dance," Kashkashian said, "you really have two characters, with two voices." "If you can truly understand this and feel it, you can have legato string crossings," she said. Furthermore, "you can actually slur that way, it's like magic." For multiple-string crossings, you can even skip that string in between, if you understand the location of the new contact point. The next violist was Cameron Audras, who played Martinu's "Rhapsody-Concerto" with pianist Barry Tan. Kashkashian started by working on getting more expressive feeling in the left hand and working on continuous vibrato. As an exercise, she had him get the vibrato going, then move the vibrating finger up the fingerboard, creating a sort of nervous-sounding upward glissando. The idea was to make sure that the left finger is relaxed and not nailed into the string. "I think a lot of your mental energy is going to your right side," Kashkashian said. She listened to one passage, then couldn't figure out why she didn't quite like it. She had him played it again, then smacked her head, "You aren't doing any vibrato!" she said. "It doesn't need to be a lot, just enough to create resonance." Similarly to what she did for voicing in Bach, Kashkashian had him play one passage pizzicato, so that he could work on getting the interaction with the piano part. Throughout the master class Kashkashian struck a good balance of talking, and then letting the student play; as well as giving advice meant for the general audience and advice meant specifically for the student. While working on getting more energy into a passage, she sensed a certain reluctance that Audras had, to bowing all the way to the frog. He admitted that he was actually afraid to go all the way to the frog -- having large hands, it just didn't seem to work. "Is your teacher in the room?" she asked. He was, and so she asked, "Can I?" Having procured permission, she went on to suggest a slight change in his bow mechanics. (This was important -- it's kind of a no-no to change a student's fundamental technique during a master class, without permission from their teacher). With this, she asked if there was an audience member who happened to have a beanie-baby or a small stuffed animal in the room. A student from the back offered up a little lamb doll. Kashkashian placed the doll in the palm of his hand, to "fill up the space," and then she had him started at the tip and go up-bow, all the way to the frog, keeping the bow parallel to the bridge. It worked! She offered another way to think of it: Going up-bow, one can imagine filling up a balloon that is in your hand, and you blow air into it as you go to the frog, until it is full and the hand is round at the frog. Next was violist Yu-Ting Hsu, who played the "Sarabande" from Bach's Cello Suite No. 6. Hsu had this music well-learned, though she seemed to struggle with the large size of the instrument and an overall sense of anxiety seemed to keep her from getting past the notes and into the music. Following her performance, first thing Kashkashian suggested was for the sake of comfort: she invited Hsu to take off her high-heeled shoes. "It's not good to wear high heels because you can't feel the ground," Kashkashian said. She also invited her to breathe. "If you were to watch a wind player, you would see that they have to breathe -- it's part of the music," Kashkashian said. "I believe a string player should also breath." One way to find the breath is to sing the music. So Kashkashian had Hsu start by singing the top line of the "Sarabande," being conscious of breathing. Then she had her strum the beginning, guitar style, still conscious of breathing. Then she had her walk, strum, and breathe -- by this time Hsu was concentrating on so many different parts of her body, she had really loosened up! Part of Kashkashian's point in strumming these chords was a recommendation that "as a general rule, arpeggiate your chords in Bach, rather than divide them in half." This gives each chord one impulse from the bow. She also emphasized perfectly accurate intonation within those chords. "When intonation works for you, everything is easier because the instrument resonates," she said. "It all adds up," meaning that all the in-tune notes of a given chord with resonate together "in one cloud," producing a richness of sound. To feel motion in the bow arm for starting those chords, she suggested the image of a hospital bed, which is raised for you, sitting you up. Likewise, "think of a feeling of passive motion for starting a chord, as if your arm is being lifted," she said. Use gravity to your advantage when breaking chords and "work toward fluidity with the bow arm and string crossings for chords." If you can solve the tension inherent in the technical problem of constantly rolling the chords, "the whole movement can become a relaxed dance." Practicing the movement pizzicato can give perspective, as the chords are so much easier to reach that way -- it takes away that technical issue of rolling chords. She then focused on the left hand and how to reach those chords with the fingers. The fingers must be relaxed as well, but stretching to reach those notes can cause strain for anyone, even more so for those with smaller hands, like Hsu. One way to address this issue is to approach the double-stop from the top, adjusting the hand position to accommodate the fourth finger. In other words, find where the fourth finger is most comfortable, and then find the posture for the hand by stretching backwards. This is sometimes helped by moving the thumb forward. Once you find this position, "if you keep the attitude (angle) of the hand, then you don't have to keep all the fingers down." Kashkashian offered some exercises for cultivating flexibility in the left fingers, warning that these exercises should be done only when you are warmed up, and just a little at a time. If you over-do it you can injure yourself! After the master class Kashkashian stayed to answer questions from the audience. When asked if she preferred hand or wrist vibrato she said that "having both at your disposal is the best solution" but also that "anything I can do with less motion is probably better," and wrist requires a little less. That said, her teacher Karen Tuttle recommended a combination, she said. She also talked about the role of a violist in the quartet, sharing that in order to play something like Haydn successfully, the violist really needs to articulate more than the second violinist. "We are required to play with more articulation and alive-ness than our partners," she said. She also talked about how studying martial arts has influenced her thinking on weight, leverage and the concept of "passive action," and about moving while transferring weight and gesture. I walked away thinking, what an amazing mind and generous spirit! She really put a laser focus on each student and offered a great deal of wide-ranging ideas, and she did so with thoughtfulness and sensitivity. Go see her teach, go hear her play, if you get the opportunity! February 5, 2019 at 03:33 AM · Oh, Laurie, I love this article! I always feel that master classes are problematic from the get-go. I mean, really, how do you change fundamental problems in 20 minutes?? But Ms. Kashkashian seems to have figured out the formula. I took so much away from the "airplane vs helicopter" landing, as but one example. Also, the comment about the high heels is so important! I've had numerous voice teachers tell me that you always need to feel "grounded" and connected to the earth. I'm fortunate that Ms. Kashkashian is coming to my area to perform the Bach, as well as a recital with Robert Levin. Trust me, I will be there, beanie-baby in hand! February 5, 2019 at 03:48 PM · Wow, what an amazing teacher! Gives me a lot to aspire to, when I am on the teaching end of things. February 5, 2019 at 04:13 PM · I love viola!!!! February 5, 2019 at 05:06 PM · Thanks for this - a lot to study here! February 6, 2019 at 01:13 AM · Thanks, Laurie, for this exceptional article. Kim Kashkashian just radiates awareness and creativity. Each one of her recordings is a different, amazing experience. Her humanity and grace bring me back to what I sought in music in the first place. How I wish I had known about this masterclass! February 10, 2019 at 11:11 PM · Viva viola. And I love Ms Kashkashian - both for her thoughtful teaching here, and for her wonderful recordings. Hopefully one day I'll get to see her live.